Any time we cover generational trends, the overwhelming reader response is that millennials aren’t different: They’re passing through the same phases as other generations, but a hysterical media is interpreting each stage as a groundbreaking consumer trend. When they're 20, the theory goes, millennials were said to not be having children. But it wasn't because they were 20, an age at which few Americans procreate, it was because they were millennials and they were special. Now that many are in their 30s, we write that millennials have discovered single-family homes. But isn't that just what happens when you get older? Didn't Generation X and the baby boomers go through the same stages? The data say no. We're getting a better picture of millennials as the bulk of the generation is near 30. 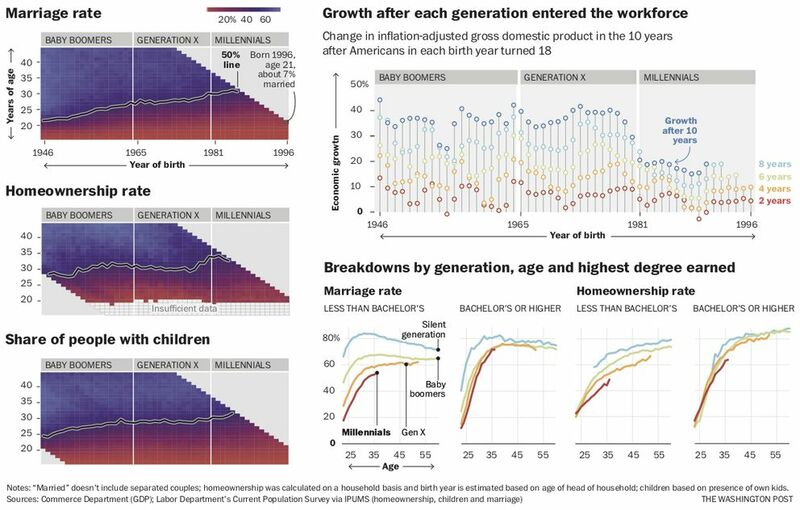 All the major life milestones - marriage, children, homeownership - have arrived measurably later for millennials than for the three previous generations for which we have comparable data. Not all reported millennial trends are backed up by data. Video games aren’t keeping millennials out of the workforce, and the workers are not hopping jobs at a higher rate, according to American University economist and serial millennial myth debunker Gray Kimbrough. But millennials’ progress through life has been measurably slowed by the Great Recession, a two-track labor market in which many high-paying jobs require a college education, and record levels of student debt. When you look at how quickly Americans hit major life milestones, sorted by year of birth, it's easy to spot the millennials (born between 1981 and 1996). The marriage rate for Americans born between 1981 and 1985 didn't top 50 percent until they were between 30 and 32 years old. The oldest baby boomers hit the 50 percent mark at about age 22. We don't have data for younger millennials yet; they're still aging their way toward marriage. The figures are derived from the Labor Department's Current Population Survey. Specific birth dates aren't supplied, so birth years have been estimated based on reported age. The age at which most Americans have a child living at home has also risen during the millennial era. It's at 31 or 32 for the 1981-1985 crew. The oldest groups of boomers hit that milestone at 25 or 26. It took until 33 to 35 for most older millennials to become homeowners. The oldest groups of boomers hit that milestone at 28 or 29. Education is one explanation for the millennial stagnation. The trends above look different when you split the generation into those with a bachelor’s degree and those without. Figures for educated millennials are similar to those for educated boomers or Generation Xers, albeit a bit lower. But less-educated millennials lag behind their educated peers, and behind less-educated members of earlier generations. Millennials are in the most-educated generation on record. A college degree is a prerequisite for an increasing share of jobs, a possible side effect of the bifurcation of the economy into high-skill and low-skill work. For the record, the education divide was wider than any other split we considered. That includes high income vs. low income, urban vs. rural and white vs. minority. In 2004, when the first wave of millennials graduated from college, Americans owed about $260 billion in student loans, according to the Federal Reserve Bank of New York. In 2018, traditionally when the youngest of millennials would be graduating, the figure had multiplied almost by a factor of six, to $1.46 trillion. A recent Federal Reserve report confirmed that debt has held young Americans back. About "20 percent of the decline in homeownership among young adults can be attributed to their increased student loan debts since 2005," Fed economists Alvaro Mezza, Daniel Ringo and Kamila Sommer found. "This represents over 400,000 young individuals who would have owned a home in 2014 had it not been for the rise in debt," they wrote. The “large, negative wage effects of graduating in a worse economy” can persist for decades, according to a widely cited 2010 analysis by University of Rochester economist Lisa Kahn in the journal Labor Economics.